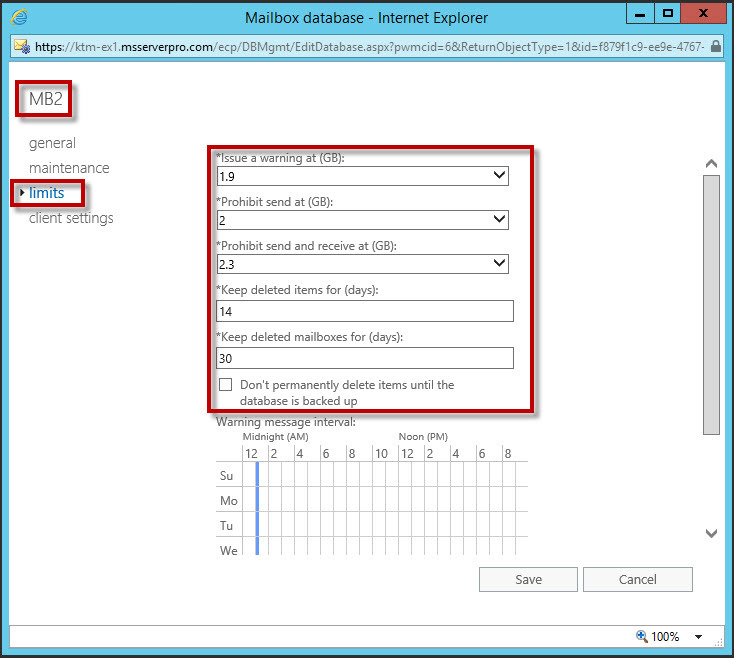 Exchange Server 2016 comes with default one mailbox database that is created by default. It is located on a system drive, and it provides initial storage for the administrator mailbox and system mailboxes. In most cases, most organizations will need more than one mailbox database to meet the organization standards such as set different limits and retention time periods from the default database. 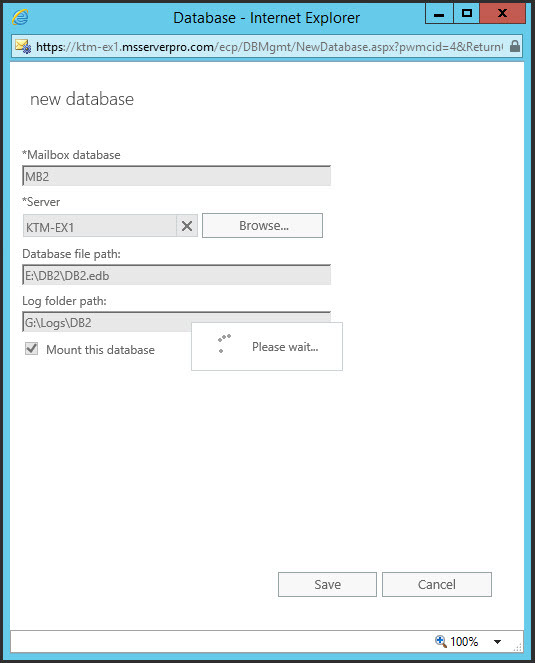 As we know, Exchange Server 2016 Standard Edition can create up to 5 mounted databases and Enterprise Edition supports up to 100 mounted mailbox databases so why not use this options. The recommended maximum DB size: 200 GB for non-replicated databases and 2TB for replicated databases. To restart the Microsoft Exchange Information Store service, run the following command; Restart-Service MSExchangeIS from an elevated PowerShell instance or command prompt. 1. On LON-EX1, click to the Start screen, and then click Internet Explorer. 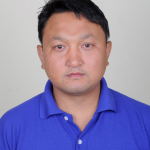 In Internet Explorer, type https://ktm-ex1.msserverpro.com/ecp, and then press Enter. Sign in as msserverpro\Administrator with the password Pa$$w0rd. 2. 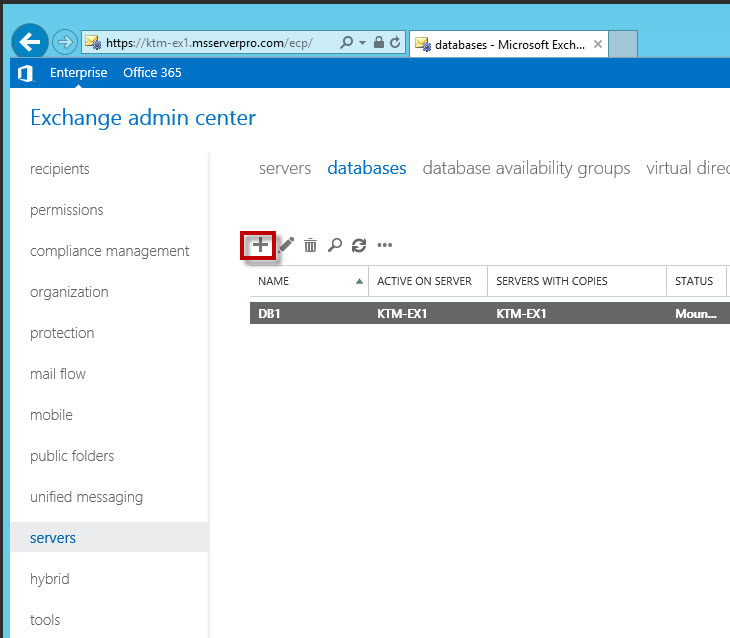 On the Exchange Admin Center page, Click servers in the feature pane, and then click the databases tab. 4. In the Database window, in the Mailbox database text box, type MB2. Click Browse. In the Select Server window, select KTM-EX1, and then click OK. 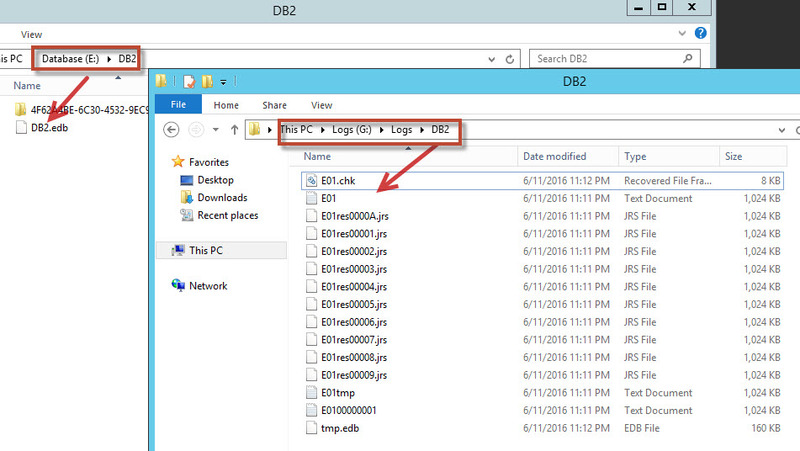 In the Database file path text box, type: E:\DB2\DB2.edb. In the Log folder path text box, type G:\Logs\DB2. Make sure that Mount this database is selected, and then click Save. Click OK.
5. 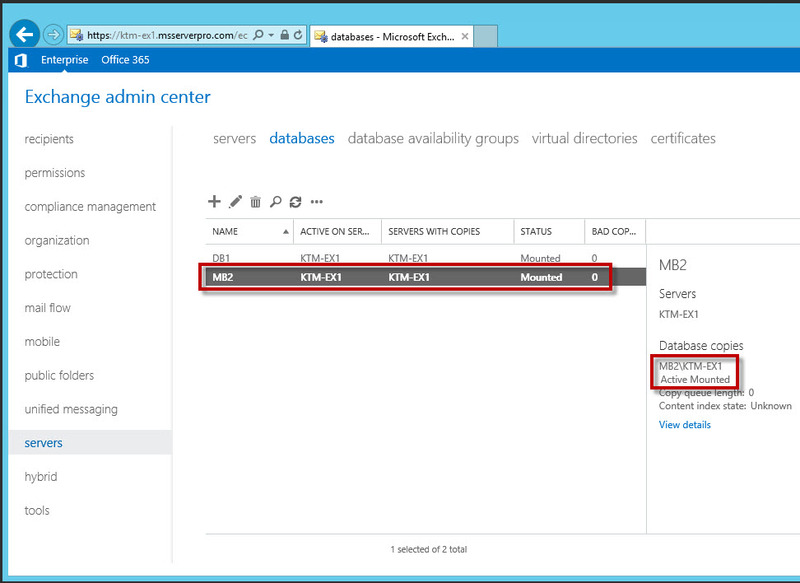 On the Exchange Admin Center, verify that mailbox database, MB2 is created and mounted. 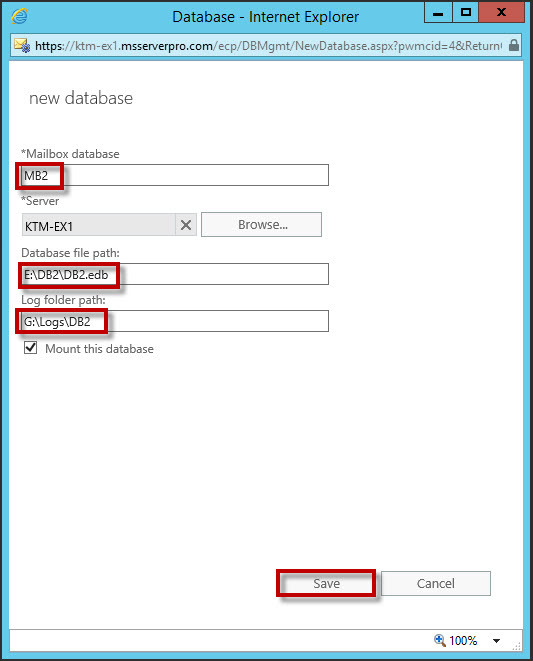 You need to modify the default mailbox database to meet the organization requirements. By default the mailbox database have issue a warning limit set to 1.9 gigabytes (GB), prohibit send at 2 GB, and prohibit send and receive at 2.3 GB. You need to set different limits and retention time periods as per organization requirements. 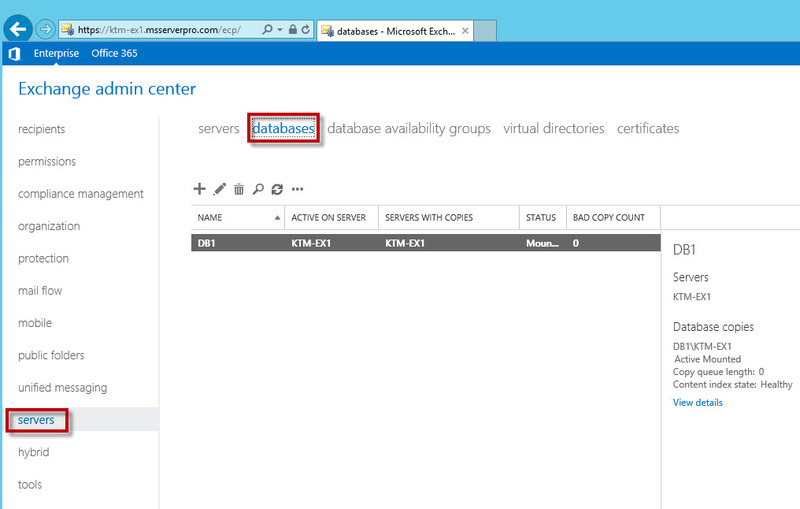 There is one more setting you should check for your databases. You also need to set modify the deletedItemRetention time periods from the default database. 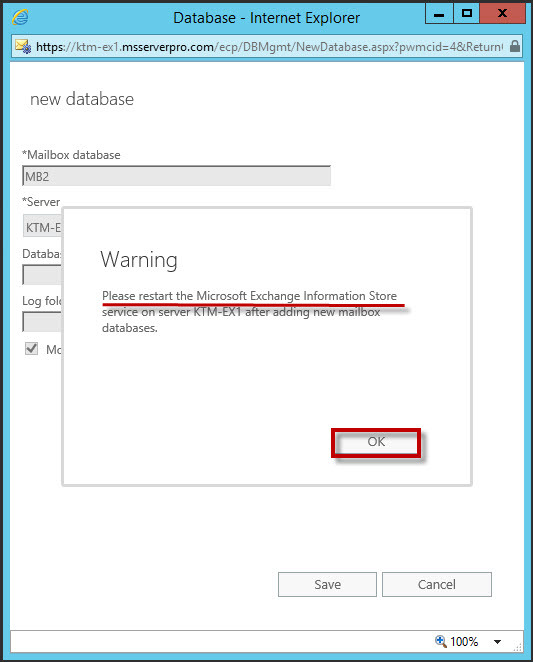 In this article, I have created a mailbox database using Exchange Management Shell and Exchange Admin Center (EAC), remove a mailbox database, and modify mailbox database limits and retention time periods from the default database in Exchange Server 2016. I hope this article helps.